Summary: The 1960s was a period of innovation for British rail freight, with many radically new designs appearing. The Freightliner wagons were a huge advance over the short wheelbase conflat wagons built before, and they were fortunately able to be adapted to the ISO standard for containers that emerged shortly after their introduction. As such, they carried the majority of intermodal rail traffic in the UK until their gradual replacement by newer types in the 1990s. History: Container traffic on BR did not start with Freightliner, several thousand �Conflat�s having been built both by BR and its predecessors. However, these were almost all short-wheelbase four-wheel designs, with custom-built containers intended for unloading by crane onto road vehicles. The idea of using bogie vehicles came about in the early 1960s when two batches of wagons were built. The 50 container flats constructed for the Condor express freight service (B510000-B510049) were of traditional design fitted with vacuum brakes, underframe trusses and conventional drawgear. They were however able to carry new-type containers up to 20ft long. The other batch comprised four prototypes of a new design featuring a skeletal framework carried on small-wheeled bogies. Two types were built to make up a four-wagon rake; two 42ft 6in long inner wagons had fixed-head buckeye couplings at each end, while two 45ft 9in long outer wagons had these at one end with buffers and a drop-head buckeye at the other. Built by BR Shildon in January 1964, the wagons were numbered B601001/B601002 (outers) and B602001/B602002 (inners), and all were fitted with mechanical clamps to accept two BR-designed 20ft containers each. The bogies were Davis & Lloyd Ridemasters with clasp brakes, these being mounted very close to the ends of the wagons. With big plans for containerisation of general goods traffic, a production batch was ordered and delivery commenced before the end of the year. These 100 wagons differed markedly from the prototypes in being 62ft 6in long (1ft longer for outer wagons) and thus able to carry three 20ft containers each. They also featured air-operated container clamps, bar-type inner couplings, and conventional drawgear at the outer ends. Ridemaster bogies were again fitted but set back further from the wagon ends, and now fitted with wheel-mounted disc brakes. The intention was to run rakes of 15 wagons so the order was split into 18 outer wagons and 82 inners, built at BR Ashford and with numbers following on from the prototypes. The brand name of Freightliner was chosen and was applied to the containers, while the wagons had minimal lettering on their black livery. It was perhaps unfortunate that BR had developed its own container mounting system at this time, as the ISO standard was fast becoming the norm. Luckily, the new wagons were broadly compatible with this, and they were all soon modified with new brackets. Some further design changes were made before the next batch was delivered. ISO container mountings were now fitted as standard, with the air-operated Freightliner clamps also retained on wagons built up until 1968. Wagons built in late 1968 and early 1969 had manual Freightliner clamps as a back-up but these were omitted on subsequent builds. A similar but newer type of bogie, the Ride Control BR 2M, was fitted, these having axle-mounted disc brakes. To distinguish these wagons from the initial batches, they were painted rail blue. Over 2000 wagons were built over the next 10 years, all but 194 of them at BR Ashford (the remainder at BR Shildon). The proportion of inner wagons to outers was changed to roughly 60/40 in line with the operational practice of using 5-wagons sets. Outer wagons were numbered B601021 to 601849 (the B prefix being discontinued at about B601493) and eventually given the TOPS code of FGA. The inners became FFAs and were numbered B602085 to 603274 (last B-prefix being about B602951). 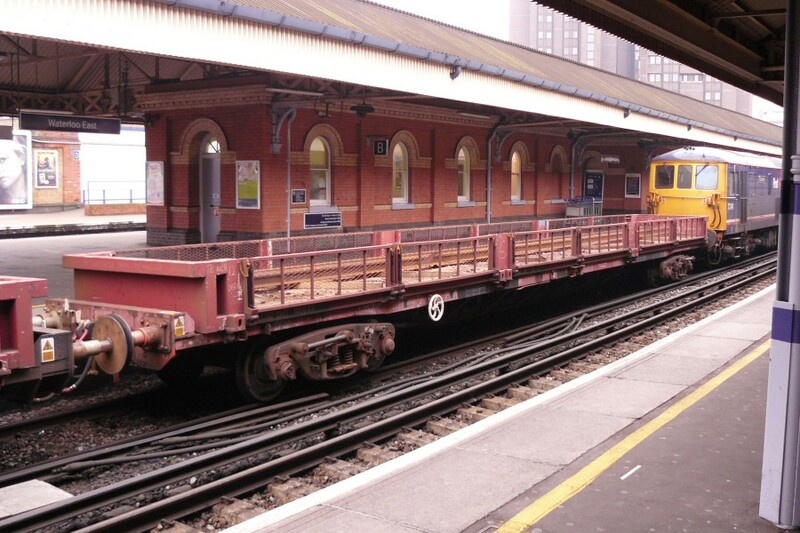 One other Freightliner container flat built during this period was B601999 with conventional drawgear at each end. This was used on mixed traffic trains in the far north of Scotland, and was coded FGB, changed to FJB in the early 1980s. Two other bogie types were fitted to Freightliner flats from new, although all shared a similar appearance. 168 wagons were mounted on F/L 1 bogies, while the last 565 wagons built had Ride Control BR 2M MkIIIs. The latter type marked a return to wheel-mounted disc brakes. A short-lived alteration was the modification of certain wagons for international traffic in 1968. A total of 99 wagons in two batches were given ferry fittings and renumbered in the 12-digit RIV series for use on a service to Paris. The first batch became 21 70 4384 000-020 (outers) and 21 70 4384 500-513 (inners), the second batch being 20 70 0499 000-027 (outers) and 20 70 0499 500-535 (inners). The services only worked until 1970 and the wagons later reverted to their domestic numbers. In the latter half of the 1970s, a number of conversions were undertaken to balance the fleet against requirements. In 1977, two inner wagons were rebuilt at Temple Mills as double-ended wagons and renumbered 601997 and 601998. These joined 601999 in Scotland. Then in 1979, Horwich converted 24 more inner wagons to single-ended outers, these taking the numbers 601850-601863. The purpose of this was to allow more two and three vehicle sets to be operated. Finally in 1980, inner wagon 602548 which had been allocated to the research department and rebuilt as a double-ender in 1976, was added to the Scottish pool as 601996. A more drastic conversion was undertaken on at least 15 early wagons in 1976. These were rebuilt with a planked floor, ramped upwards to headstock level on the outer wagons. A curb-rail was fitted to the sides and folding plates at each end. 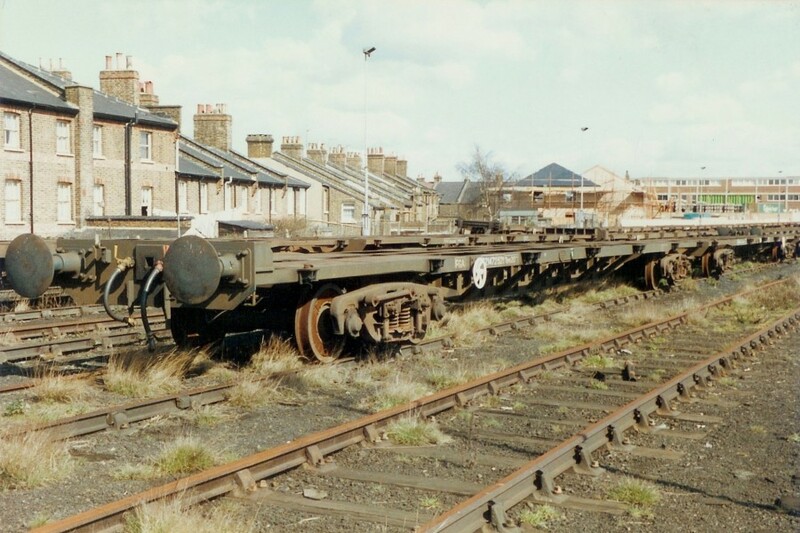 In this form they were recoded as FMAs and were used in three-wagon sets to transport lorry chassis from Bathgate to Birmingham. In 1980, wagons that were �non-standard� were renumbered to make them more readily identifiable. Wagons with Ridemaster bogies had 10000 added to their numbers, these mainly being those from the first 100, but also some of the 1979 rebuilds. Wagons with F/L 1 bogies had 20000 added to their numbers. Such wagons were early candidates for withdrawal, although a number were transferred to Railfreight for use on services carrying waste containers. Such transfers were recoded as FYA (outer) and FUA (inner) and several were repainted in Railfreight red. In March 1986, 40 FYAs and 56 FUAs were in stock, this rising to 76 and 111 respectively by April 1987. In 1981 Standard Wagon Co built an experimental Freightliner flat in an attempt to produce a lighter, stronger design. This resembled a standard wagon with the solebars removed, the load being supported on outriggers from the central spine. Given the number RDB998546 in a series more normally used for crane match wagons, this single-ended wagon was given the TOPS code of YXA but was often used in normal Freightliner services. In about 1990 it was recoded as an FGA and renumbered 601995 (curiously in the same series as the double-ended FJBs). The strangest conversion of all befell inner wagon 602150 in the early 1980s. Taken over by the research department as RDB602150, this was rebuilt with a section of coach body in the centre of the wagon only. At each end were large weight blocks and conventional bufferbeams. The whole wagon was remounted higher up on its original bogies such that the headstocks were below the solebars rather than above them as on normal Freightliner wagons. A retractable single wheelset was fitted below the centre of the wagon and the strange looking contraption was used to measure lateral track forces. Repainted in research department blue and red, it was lettered as �Laboratory No 25 Decapod�, the name deriving from the fact that it now had 10 wheels. Several other Freightliner flats have been transferred to departmental use over the years, including three wagons used as a tunnel inspection and repair train, and several used for mini-container experiments. There have also been at least three instances of wagons being sold for further use. In 1991, four wagons were sold to the Docklands Light Railway in London. These were extensively rebuilt to create two 40ft long flat wagons for use on permanent way trains. In 1992, two FGAs were sold to Nomix-Chipman Ltd and renumbered in the private owner fleet as CC95490 and CC95491. They were fitted with modules containing equipment to spray weedkiller. Finally, FJA 601998 was modified as a water carrier with two tank containers by 1999, for use by the King Edward 6024 Loco Preservation Society based at Tyseley. In 2005 it was sold to them and renumbered SLT98997 with the unusual TOPS code of XAA. After many years intensive use, the fleet was showing signs of fatigue by the late 1980s, often caused by loading heavy 40ft containers at one end without a balancing 20ft container at the other. Freightliner ordered a large batch of replacement wagons to a similar configuration, these being delivered in 1991 as types FSA and FTA. The original design was also limited in that it could not carry the increasingly common 8ft 6in and 9ft tall containers, and later types were to attempt to redress this. By 1998, 230 FFAs and 300 FGAs remained in stock, this dropping to 65 and 144 respectively by late 2005. After replacement on refuse carrying services by new FCA wagons, 18 of the FYAs were rebuilt by Marcroft in 2002. These became double-ended FJAs and were renumbered as 621900-621917. Despite the code, these wagons were in fact intended for departmental use carrying sleepers. They have a low body with drop-down mesh sides and solid floor and ends, this being mounted on the existing container sockets. The body is painted in EWS maroon, while the wagons retained Railfreight red. 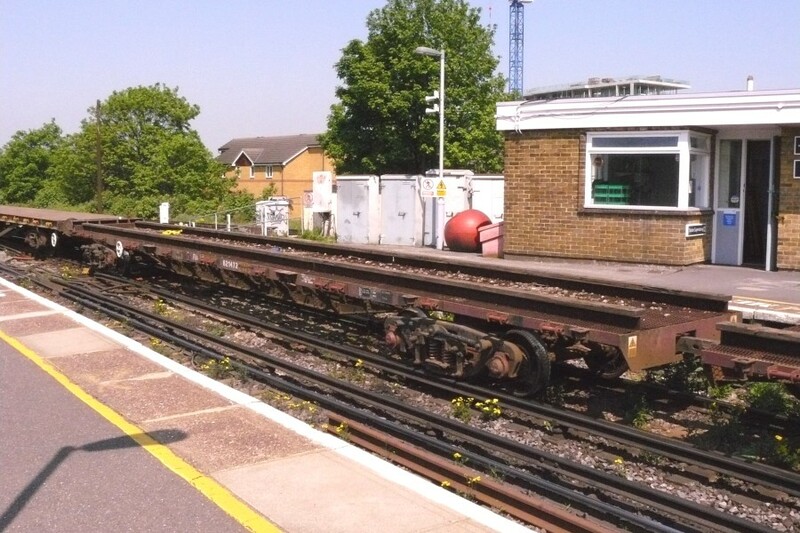 Most of the remaining FYAs were recoded as FDAs and fitted with mesh floors, strap tensioners and two longitudinal baulks to allow the carriage of track panels. As none of the FUA (inner) wagons were converted, the FDA wagons work in pairs. 10/01/2008: Former identity of SLT98997 added. 12/05/2008: Details and picture of FDA added. 16/03/2010; Photo of FJA added. FGA 621472 stored at Willesden, 29th March 1987. Note the lack of drawgear. The same wagon (621472) as an FDA at Lewisham, 7th May 2008. FJA 621909 at Waterloo East on 6th March 2010. The join where the new headstock was added is visible on similar 621910 on the left.